This is a Redfire 2006 Mustang GT. Modifications include: Fang shaker hood with deck latches, front chin spoiler, and a Flowmaster exhaust system to let the 4.6 breathe. The word "shaker" comes from the fact that the hood scoop is attached to the top of the engine, not to the hood. When the engine is running, it shakes with the revving of the engine. Performance White 2006 Mustang GT coupe owned by David McKay from Tulsa, Oklahoma. It has a 281ci 4.6L V-8 engine under the hood. David modified his Mustang with a different front grille, over the top stripes, a different spoiler, quarter glass side scoops, and GT350 rocker stripes. So, you say your 2006 Mustang GT needs some changes to make it look different from the other GTs on the road. How about the Cervini's Eleanor body kit (part C-300)? You can order it for a mere $12,900. Add a bit more for matching paint, a lowered suspension, and modifications to get the exhaust to exit out the sides. This Tungsten Gray 2006 Mustang GT is owned by Todd & Desley of Buena Vista, Colorado. Todd and Desley write that they bought this car from Texas a year ago with the CDC shaker hood, flowmaster 20 inch exhaust, and KMC wheels already installed. They added the Boss graphics themselves and the rear louvers and BOSS flare to make it look their dad's 1970 Boss 302. Take a look at this Vista Blue 2006 Mustang GT convertible owned by Tim Sumner. It has ghost flames painted on the front end. Other modifications include 20-inch Razor wheels, C&L CAI, smoke painted tail lights, and DiabloSport Tune. Screaming Yellow 2006 Mustang GT with 18 inch wheels. This car is bright. Get close to your screen and stare at the base of the radio antenna for 30 seconds, then close your eyes. Can you still see the Mustang? It is probably purple in color - because you burnt out the yellow sensors in your eyes temporarily. Windveil Blue 2006 Mustang GT coupe owned by Geoff Settles from Tucson Arizona. This was our featured Attitude Of The Week photo for March 22, 2009. Geoff tells us more, "My wife and I bought the Mustang brand new in July 2006. I only drive on sunny dry weekends. As of March 2009 it has only 8,500 miles. I've kept the Mustang pretty much stock for the exception of intake cover, tri-bar pony floor mats, and sequential tail lights. I just seem to love the clean stock look." Vista Blue 2006 Mustang GT with an aftermarket turbo charger under the hood. Two blue colors were available in 2006. This is the darker of the two. Performance White 2006 Mustang GT with Steeda lowering springs, CDC classic chin spoiler, Jack Roush quarter window louvers, painted mirrors, and a GT-500 replica spoiler. Legend Lime 2006 Mustang GT coupe owned by Paul McAndrew from Fallston, Maryland. It was one of our Attitude of the Week cars back in 2009 (see the last image in this set). Lots of modifications to this car, and tastefully done. The windshield says "Krypton Knight"
This awesome Satin Silver 2006 Mustang GT convertible with red leather seats, black stripes, side scoops, rear decklid spoiler and 18 inch polished aluminum wheels is owned by George Maxwell of Louisville, Kentucky and was our Attitude Of The Week for May 23, 2010. This is a Foose factory conversion on a new Mustang GT coupe. It is Foose conversion #31 of 53 cars built in 2006. Foose modifications include: aluminum hood, front and rear facia kit, aluminum billet grilles, 2-1/2 inch front turn signal lamps, side C-pillar scoops, three-piece rear decklid spoiler, rocker and door cladding, an open air induction system, performance exhaust system, custom coil springs in all four corners, tuned struts and shocks, high performance stabilizer bars, Foose wheels 20x8.5 in the front 20x10 in the rear, 255/35ZR20 tires in the front, 275/35ZR10 tires in the rear, custom sill plate inserts, Foose Logo embroidered front seats, Foose logo front floor mats, custom Foose speedometer, and Foose speaker covers. Screaming Yellow 2006 Mustang GT coupe owned by David from Clinton Township, Michigan. This was our Attitude Of The Week for the week starting June 26th, 2010. This GT has dual over the top black racing stripes and SVT wheels. Mike Rodriguez use to own this Torch Red 2006 Mustang GT coupe. Mike tells us, "This was my very first Mustang that I have ever owned. 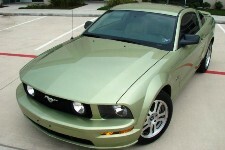 A 2006 Ford Mustang GT, with tan leather interior, 6 CD changer stereo, and an automatic transmission. A chrome custom grille, that made it unique and drawn a lot of attention. A year ago I traded it in for a 2010 Ford Mustang GT, same color but this time around it's a 5-speed. I am planning to trade the 2010 Stang, for a Shelby GT500, Lord wiling soon. Peace and GO FORD!" Triple Black 2006 Mustang GT convertible owned by Robert Hall from Hinesville, Georgia. This one has the 4.6L V8 engine and an automatic transmission. Triple black because the paint is black, the convertible top is black, and the interior is black. Torch Red 2006 Mustang GT convertible owned by Michael Martin from Livingston, Texas. It has the 4.6L V8 engine and a manual transmission. Micheal adds, "Owned for over a year. Love it." Screaming Yellow 2006 Mustang GT convertible owned by John Rouse from Kinston, North Carolina. It has the 4.6L V8 and a manual transmission. Modifications include front bumper, hood, over the top stripes, hood pins, and a Cobra emblem in the grille. Black 2006 Mustang GT owned by Jack Naus from Manitowoc, Wisconsin. This is our featured Attitude Of The Week for the week starting July 5, 2015. It has the 4.6L V8 engine and a manual transmission. Jack says it has all the mods. The Lake Michigan fog was used as the backdrop. Jack tells us more, "I finished this car about three months ago. I did it all myself and haven't touched a muscle car since High School. But when I first saw this car, it didn't look at all like this. It had a bunch of red stripes and different wheels, and it was absolutely stock. But at 35,000 miles only, it has never seen rain or snow. What you see now is exactly what I saw first time I laid eyes on it, and it has taken a year and a half and of course a ton of cash for the changeover." Performance White 2006 Mustang GT coupe owned by Michelle Cole from Smithville, Texas. It has the 4.6L 281ci V8 engine and a manual transmission. This is our featured Attitude Of The Week for the week starting February 14, 2016. Michelle tells us, "I bought my 06 when it was two years old from a lady friend that bought it new. The car had low miles, was always garaged, and very clean. About a year after I bought the car, I was at Lone Star Ford in Houston looking at a new pick up when I spotted a new Mach 1 Mustang. On closer examination I found out that the dealer was making Mach 1 clones and selling them. They were tricked out with lots of optional after market parts to make them look a lot like the original Mach 1 cars. That gave me the idea to make my 06 GT into a Mach 1 clone. The mods include; shaker hood scoop, performance anti sway bar, X Pypes catless exhaust system, Silver Horse louvered quarter windows, honeycomb rear panel, Astra Hammond chin spoiler, center grille rally lights, side scoops, Mach 1 side stripes, short throw Hurst shifter, red shifter boot, red console armrest cover, Mach 1 emblem on dash, Mach 1 letters on trunk, and Mach 1 rear faux gas cap." Windvail Blue 2006 Mustang GT sent in by a site visitor. This one has the stock 4.6L V8 engine and a manual transmission. This is a customized Redfire 2006 Mustang GT coupe. It has a modified hood, side scoops, rear quarter window scoops, different spoiler, and painted rear view mirrors. This Screaming Yellow 2006 Mustang GT coupe was on display at the Central Illinois Mustang Association's show at Dennison Ford in Bloomington, Illinois. This car came down from Wisconsin. It has lots of modifications. I like the two tone body colored door mirrors. Legend Lime 2006 Mustang GT convertible with custom wheels, custom side stripes, custom grille pony, and engine upgrades at the 2010 Mustang Roundup in Tampa, Florida. This Black and Copper 2006 Mustang GT coupe has many custom features including a black and copper colored leather interior. It was at the 2010 Mustang Roundup car show in Tampa, Florida. Redfire 2006 Mustang GT with Boss stripes on display at the 2010 Central Illinois Mustang car show in Bloomington, Illinois.